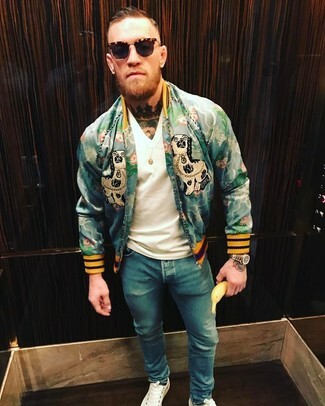 If you're all about functionality dressing when it comes to your personal style, you'll love this stylish pairing of a green print bomber jacket and blue skinny jeans. 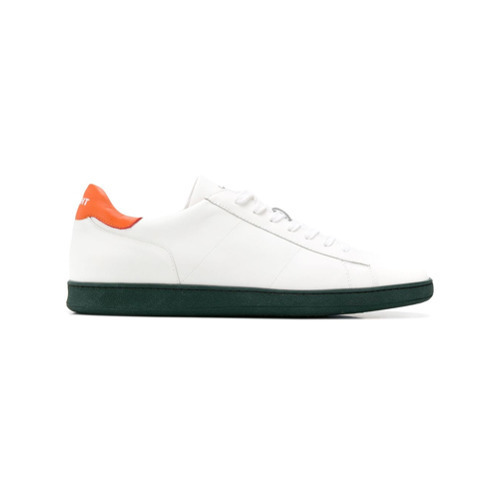 You could perhaps get a little creative in the shoe department and lift up your getup with Rov basic low top sneakers. 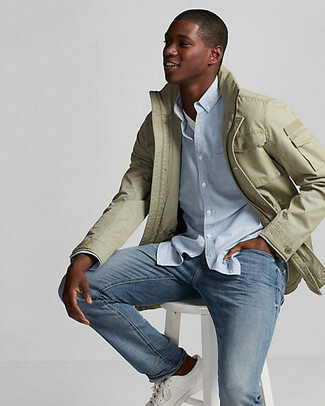 Dial down on the formality in this functional combo of an olive field jacket and blue jeans. 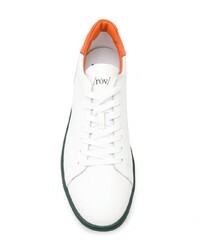 Rov white leather low top sneakers are a good idea to complement your ensemble. If you prefer relaxed dressing when it comes to your personal style, you'll love this easy combo of a black sweatshirt and black sweatpants. When it comes to footwear, this ensemble is round off well with Rov basic low top sneakers. 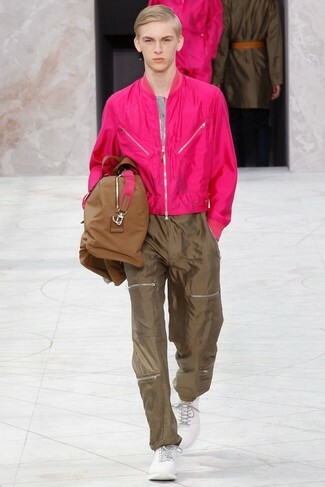 If you're looking for a casual yet sharp ensemble, consider wearing a hot pink bomber jacket and brown sweatpants. As well as very comfortable, both of these pieces look great when paired together. 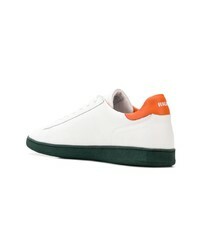 Rov basic low top sneakers from farfetch.com complement this ensemble very well. If you're on a mission for a casual yet on-trend ensemble, try teaming a navy shawl cardigan with navy skinny jeans. As well as very comfortable, these pieces look wonderful paired together. 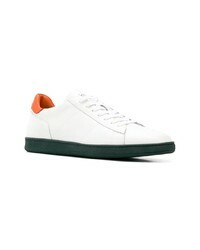 Finish off this getup with Rov basic low top sneakers from farfetch.com. 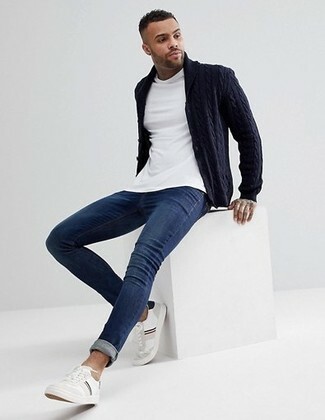 If you're a fan of relaxed dressing when it comes to your personal style, you'll love this stylish pairing of a navy shawl cardigan and light blue ripped skinny jeans. Spruce up your getup with Rov basic low top sneakers. 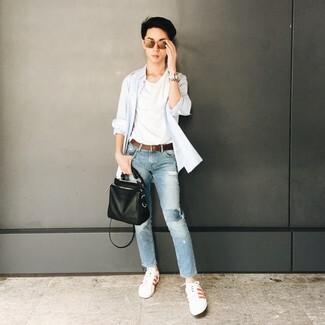 Marry a light blue long sleeve shirt with light blue ripped jeans to be both neat and relaxed. A pair of Rov basic low top sneakers will bring a strong and masculine feel to any ensemble. For a nothing less than incredibly stylish ensemble, pair a white linen long sleeve shirt with olive dress pants. Opt for a pair of Rov basic low top sneakers to make the look current. 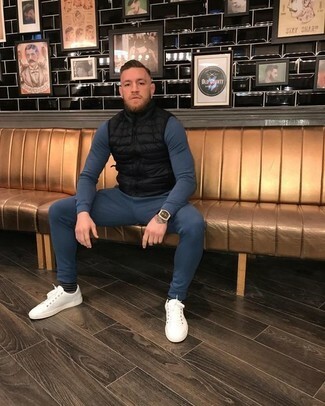 If you prefer relaxed dressing when it comes to your personal style, you'll love this simple combination of a black quilted gilet and navy sweatpants. Got bored with this ensemble? Enter Rov basic low top sneakers to change things up a bit.